Common laptop problems include broken charging ports, impact damage to the case, keyboard failure, heat related issues and liquid spill damage. Our expert techs can handle any problem you may have with your laptop and get you up and running again. Laptop repair is often more difficult than desktop repair because the case which holds the laptop’s components is much smaller and more difficult to access. We have the knowledge and experience to deal with this issue and more, such as regular servicing and preventative maintenance, which are important for keeping your laptop in good working order. If your laptop is bogging down and running slow then you need a tune-up and possibly even a virus removal. This preventative maintenance will give you peace of mind now and help prevent a catastrophe in the future in case your laptop crashes. Everyone needs a secure data backup system in place in case the worst happens and we’re here to help keep you safe. If you’d like to discuss any questions about laptop repair and service, feel free to call us at (502) 963-3981 and we can discuss your issue today with absolutely no obligation. At my computer repair shop in Louisville I see these five problems over and over. Sometimes it is the result of normal wear-n-tear. Parts wear out, right? And there are plenty of lemon parts with computers. I’ve seen a new hard drive fail in the first thirty days of use, for example. But sometimes accidents happen. And, often mistakes are made due to the fact that people don’t know how to properly maintain and handle their computer equipment. This article will make you aware of lurking dangers so you can avoid accidents and maintain your equipment properly, and avoid these costly and preventable laptop repairs completely. DC Jacks or charging ports take a lot of abuse. I know I’ve had several ignitions in my car replaced over the years. When I was a starving college student I remember one winter I would spray deicer in the ignition so my key would work. It got me through the winter, but finally I had to replace the ignition. The DC Jack on a laptop is the hole where the power adaptor or “charger” plugs into the computer. In most laptop units, the DC jack is directly soldered onto the motherboard — which not only makes it delicate but also expensive to repair. Often the entire laptop has to come apart to do the repair as there is no access anywhere around the jack. The three most common reasons the jack breaks is: 1.A child or animal trips on the cord. 2. People jerk the cord out hard and at an angle and do not realize it is not that difficult to break a solder joint and 3. People travel — either across the room or across the city — with the charger still connected to the laptop. Don’t do it! Perhaps even more common is laptop screen repair and replacement. I have seen laptop screens break when someone picked up a laptop by the corner of the screen to move it off of the floor up onto a table. Their thumb went right through the screen. I almost did it once myself. It is a very delicate screen. It does not have to be a dropped or take a hard impact to cause a cracked laptop screen. Another common scenario is closing something in the laptop. A mouse, a letter opener, even a flash drive left on the keyboard when the laptop is closed can cause a screen to break or fail. It is an expensive repair depending on the laptop screen and computer make and model. So, be aware of this “soft spot” on your laptop and be extremely gentle with it. Perhaps the most expensive and devastating, but rather common laptop repair is motherboard repair. This is what I consider a “catastrophic event” in the computer repair business. The entire machine has to come apart, the board taken out, and repaired at the microscopic level with expensive equipment or replaced entirely. It can be hard to determine what causes a motherboard failure. Static electricity, power surges and spikes, overheating, mishandling of components inside of a machine, or manufacture defeats can all be culprits. Using a power strip, not taking apart your machine and handling the components, keeping the fan intake basin free of debris and unimpeded and the exhaust vents open and unimpeded can all help. For a full discussion on motherboard failure see this blog post on the topic. Although it should be intuitive sometimes in a panic people forget to turn their laptop off and unplug it after they spill a drink onto the keyboard area. This is step one. Sometimes people remember to power their laptop off after a spill only to make the mistake of powering it back on a few minutes later to see if it works. A laptop with liquid damage should not be powered on. The laptop needs to be taken apart by a qualified laptop repair profession or laptop repair shop and each component inside of the machine dried out, cleaned and inspected for damage. Even if you have found your laptop to be operable after a spill it is important to note that there could still be liquid inside the machine that might cause corrosion or rust on the components, especially the motherboard which can cause your laptop to fail at some point in the future. Laptops run hot. 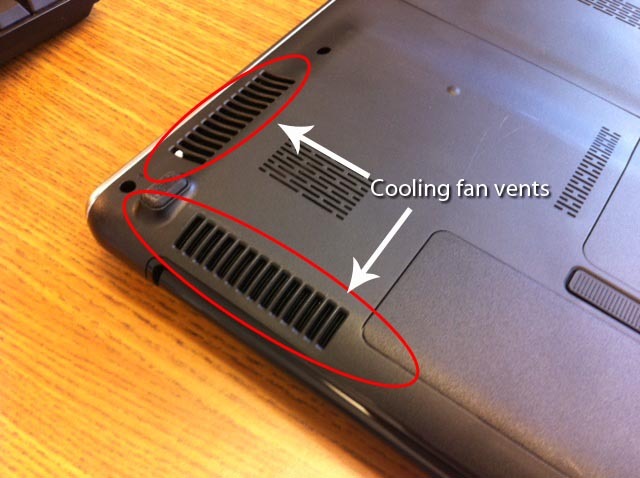 Fans, heat sinks, thermal paste, and air intake basins cooling fan vents that are designed to keep a laptop cool are often NO match for the heat generated by a laptop. These things do work. However, the airflow architecture on the motherboard of a laptop only works if unimpeded by anything and is running smoothly. It is a delicate design. Many things can impede airflow and cause your laptop to overheat. I observe people every week covering up the air intake basin on the underside of a laptop by putting it in their lap and not realizing they are covering it up. This can cause a laptop to heat up super-fast. I have a CPU temperature monitor on my laptop and I can watch the internal temperature of my laptop go up to dangerous levels right before my eyes by covering this intake basin up. Small items like speakers blocking the exhaust vents can make a noticeable difference in hot air dissipation. Fans that aren’t cleaned out on a regular basis (and I mean blown out with compressed air on a weekly basis and cleaned by a professional every year at your annual virus check and tune-up) can get a build-up of animal and human hair, dust and other types of debris that prevent the laptop fan from working and cooling your laptop properly. Finally, if your laptop is running at extremely high temperatures and you’re trying to get an extending life from it you can have a laptop repair professional disassemble your laptop and soak your fan in cleaning solution and reapply thermal paste to the processor. My old laptop, which is now my field machine, lived the first years of its life set up in my home office. It hardly ever went mobile (only when I traveled out of town). It is way past average life expectancy and still runs great at ten years old. So, heed the warnings and follow these simple suggestions and avoid these expensive and common laptop repairs in your future. Whatever the case with your laptop if you have any type of problem On-Site Louisville Computer Repair Co. has you covered on repair and service. We offer computer service all major brands including: Dell Laptop Repair, Hewlett Packard Laptop Repair, Lenovo Laptop Repair, Toshiba Laptop Repair, Asus Laptop Repair, Acer Laptop Repair, Sony Laptop Repair, IBM Laptop Repair and many others and we are here if you need us. At On-Site Louisville Computer Repair Co. we do laptop repair in Louisville Kentucky and surrounding areas for all major brands. Whatever your laptop problem feel free to call us for a phone consultation so we can solve your problem and get your back on the road with your laptop, today.